A Bucks County brewery is unveiling a new beer inspired by Philadelphia Eagles center Jason Kelce on Saturday. Broken Goblet Brewing in Bristol announced plans in late February to release its new Kelce-inspired unfiltered IPA, appropriately named "No One Likes Us, We Don't Care," the tune sung by Kelce on multiple occasions during the Eagles' Super Bowl victory parade on Feb. 8. The brewery said it brewed two batches of the beer and will have about 500 Crowlers for sale. The rest will be available on draft for the release, which started at noon Saturday and will run at its spot on 1500 Grundy Lane until the beer sells out. The 14-ounce drafts will cost $5 and take-out Crowlers will be $15, the brewery said. 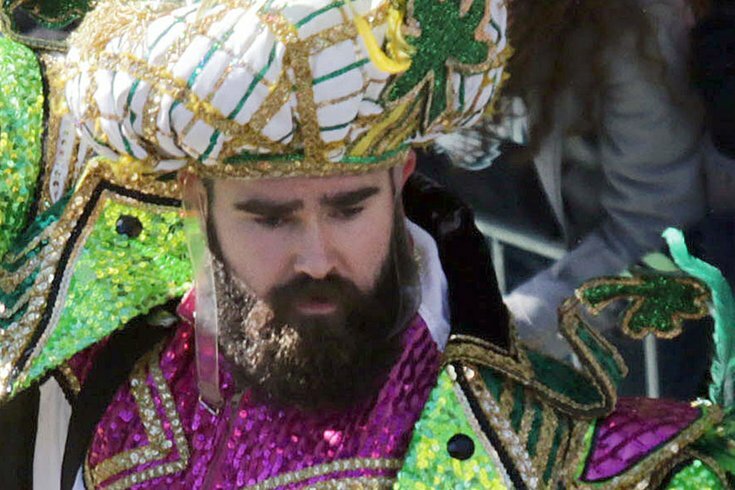 Cans of the new ale feature an illustration of Kelce in a mummer's suit like that of the one he borrowed from the Avalon String Band to wear during the parade. Broken Goblet also plans to have multiple food trucks on hand for the event and plans to sell "No One Likes Us, We Don't Care" shirts and stickers for sale. The brewery wrote on Facebook just after 11:30 a.m. Saturday that about 270 people were already lined up and waiting to receive their pour. "This might be an incredibly busy day for our little spot," the company wrote on a Facebook event page. The brewery will donate 20 percent of its gross sales from the release to the Make The World Better organization, a nonprofit founded by former Eagles defensive end Connor Barwin that aims to improve parks and other public spaces in Philadelphia. The Bucks County Courier Times reported that Kelce had asked the brewery to make the donation. Co-owner Mike LaCouture told the newspaper that Broken Goblet isn't expecting Kelce to attend.